Vršac (German: Werschetz) was first mentioned under the name of Podvršan in the writings of Sigismund, King of Hungary, in 1427. It was conquered by Ottoman troops in 1552 and only freed in the early 18th century by Eugene of Savoy. The area was largely depopulated and resettled with German colonists from the Moselle area in 1717. Frenchmen, Spaniards and Italians populated the region as well and the area became part of Banat and capital of Vršac district in 1718. The German colonists founded a new settlement next to Vršac called German Vršac. Its administrator was called “Schultheiß”, which is an archaic word for mayor. The two settlements were united in 1794 and were alternately under the administration of Serbs and Germans. In 1790, the first Latin High School was founded and the city became a centre of education and culture in Banat. In the early 19th century, the city was given privileges of a free trade town and developed into a centre of craftsmanship. With the establishment of a railway and a telegraph line, Vršac became a flourishing city. 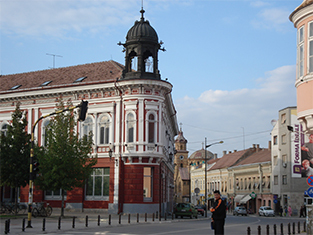 Among the famous citizens of Vršac are Historian and museologist Felix Milleker, who founded the oldest Museum of Vojvodina and published several works on the history of Banat and the Germans in the region. Pop art painter Robert Hammerstiel was also born here. After World War I, Vršac became part of the new Kingdom of Yugoslavia and lost its significance as a trade town, which had stemmed from its location on the border. After the German occupation around 1841, the harmonious relations between Germans and Serbs in Vršac became more and more troubled. Today, Vršac has become a strong economic centre of Serbian Banat through viticulture and a pharmaceutical factory. 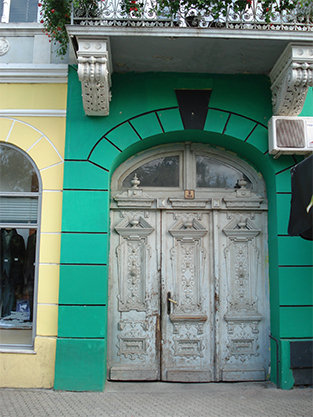 The historical main gate of Vršac.